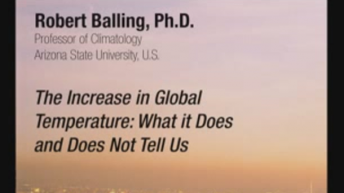 Robert C. Balling Jr. is a professor in the climatology program in the School of Geographical Sciences at Arizona State University. Prior to accepting a position in Arizona, he was a faculty member in the climatology program at the University of Nebraska. Over the past 20 years, Balling has been involved in a variety of interrelated climatological issues. He has published more than 125 articles in the professional scientific literature, received more than $3,000,000 in research grants, presented lectures throughout the United States and in more than a dozen foreign countries, and appeared in a number of scientific documentaries and news features. He has served as a climate consultant to the United Nations Environment Program, the World Climate Program, the World Meteorological Organization, the United Nations Educational, Scientific and Cultural Organization, and the Intergovernmental Panel on Climate Change. Balling has written three books on climate change: The Heated Debate: Greenhouse Predictions Versus Climate Reality, Interactions of Desertification and Climate, and The Satanic Gases: Clearing the Air about Global Warming.